Prominent & Leading Manufacturer from Mumbai, we offer Meade 16 Telescopes, Meade Telescopes, Meade 14" ACF LX850 Telescope, Celestron Telescopes, Meade 12" Dobsonian Light Bridge Telescope and Meade 20" MAX ACF Telescope w/ Starlock, MAX German EQ Mount. The most widely used research telescope on earth now comes with the most advanced optical system. Meade's LX200-ACF brings Advanced Coma-Free (ACF) optics within reach of aspiring astronomers everywhere. Nearly every observatory reflector in the world uses an aplanatic (coma-free) optical system like the Ritchey-Chrétien (RC), including NASA's Hubble Space Telescope. Now you can own similar optics to what the professionals use. The LX200-ACF includes all the field-proven features of the LX200 including GPS, Primary Mirror Lock, Zero Image-Shift Microfocuser, Oversized Primary Mirror, SmartDrive™;, Smart Mount™, AutoStar® II and more. Plus, the LX200-ACF comes with observatory-class optics and a Series 5000 26mm 5-Element Plössl eyepiece. The new LX200-ACF. It's the biggest news in astronomy since, well, the LX200. Note: The Specifications and colors may vary due to recent improvements in design. Featuring revolutionary Starlock technology, the Meade LX850 is the quintessential full-package imaging platform. Drawing from 39 years of astronomy innovation and experience, Meade Instruments has put every feature the astrophotographer could want into one amazing bundle. Based on the award winning ACF (Advanced Coma-Free) optical design, Meade has made the LX850 optical tubes faster and shaper. At only f/8, exposure times are dramatically shortened. High contrast baffling assures crisp images from edge to edge. Adding to the crystal clear view, an internal micro focuser offers two speeds of control at a 10:1 ratio and with an ultra solid connection to the primary mirror the need for a mirror lock is eliminated. We are a top-notch organization, engaged in providing Celestron Telescopes. The CGEM DX 1100 Edge HD package includes the Celestron CGEM DX mount and new EdgeHD optical system. The EdgeHD 11" optics produce a focal plane three-times flatter than the standard equivalent SCT telescope with diffraction limited stars to the very edge of the SBIG STL6303 field of view! The CGEM DX 1100 Edge HD has re-designed mechanics guaranteed to help you get the maximum performance from your instrument. Heard the term "Light Bucket"? Well, the Meade 12" LightBridge is just that! With 12" of aperture, you will be collecting light from the far reaches of the Universe. See thousands of galaxies, nebulae, star clusters, and more! The lightweight aluminum truss-tube design of the Meade LightBridge includes a 2" Crayford-style machined aluminum focuser with 1.25" adapter, steel RA roller bearings and built-in primary mirror cooling fan. Note : The Specifications and colors may vary due to recent improvements in design. The Meade 20" MAX2-ACF Telescope comes with Starlock technology, MAX German EQ Mount and MAX Tripod. Smart Drive includes PPEC and the Autostar Handbox contains a 144,000 object library. The Meade 20" MAX2-ACF Telescope offers fast f/8 Advanced Coma Free optics topped off with UHTC coatings. Carbon Fiber/Kevlar Optics Tube features electronic front focusing complete with local network and remote web control. Internal knife-edge baffles for absolute maximum contrast. The Takahashi FS-60CB incorporates a front element calcium fluorite crystal lens. Rear element crafted from hard multi-coated low dispersion flint glass. The Takahashi FS-60CB offers 60mm aperture at f/5.9 - perfect for astrophotography, eclipses, birding, travel, etc. Otho-Apochromatic Triplet Lens incorporates an FPL-53 ED glass to eliminate chromatic aberration. 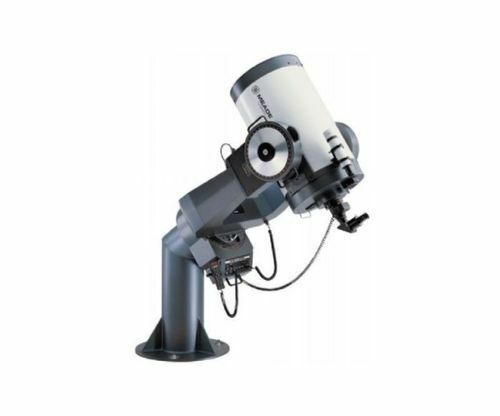 The Takahashi TOA-150B Refractor Telescopeprovides superior light transmission and excellent contrast, and has a focal ratio of 7.33. Fully antireflection multi-coated with interior knife-edge baffles. The diffraction limited Celestron CPC 1100 XLT Telescope features SkyAlign technology for easy setup and accurate go-to computerized functions. Employs an internal GPS receiver that automatically downloads the date and time from orbiting satellites and pinpoints its exact location on Earth. The Celestron CPC 1100 XLT Telescope features meticulously matched and hand-figured optical systems. By: B & H Entertainment India Pvt. Ltd.